The profound effect that the web has had on business, changing the way customers buy and how businesses operate, will be repeated by blockchain. Blockchain is that significant, it will impact virtually every area of our lives, eliminating many business roles and changing others. The problem is that the types of system that most companies use, ERP, Planning and B2B systems, were not designed to work in a multiparty network world. There are plenty of blockchain-based startups that know this and are targeting these systems and lagging industries with their blockchain platforms. In much the same way that AirBnB and Uber have disrupted the hospitality and taxi industries, so these startups aim to remove the complexity, costs and delays that plague many B2B industries. So companies must transition to this new, decentralized and multiparty networked world of the future. However they have a major challenge in making the move from their current enterprise-centric IT systems to the multiparty network world of blockchain. In the same way that billions of people around the world are currently connected to the Web, millions and then billions of people, will be connected to blockchains. The Real Time Value Network is a One Network’s cloud platform for multiparty networks. It acts as a hub, connecting to all types of enterprise technology, including ERP and portals systems, through EDI, APIs and other technologies. The Real Time Value Network provides a modular and adaptable platform for assembling solutions, customizing modules and extending them, to create multiparty network solution for your trading ecosystem. The RTVN includes ONE Blockchain, blockchain platform that writes to multiple blockchain networks, including a private blockchain and public blockchains such as Ethereum and Hyperledger Fabric. One Network’s Real Time Value Network is a bridge between the old and current systems, and the new multiparty network world of blockchain. It allows companies to break out of the enterprise silo, connect to a multiparty network, and leverage new technologies like blockchain and artificial intelligence, while continuing to gain maximum value from existing IT investments. The Real Time Value Network includes a “Tunable System of Control” that coordinates these various systems, delegating multiparty processes (and even individual steps in processes) to the appropriate system. This is the unique technology that enables old and new systems to work together seamlessly, leveraging data and processes from across the network to synchronize and optimize business processes and decisions with better data, increased accuracy, generating unbeatable value. 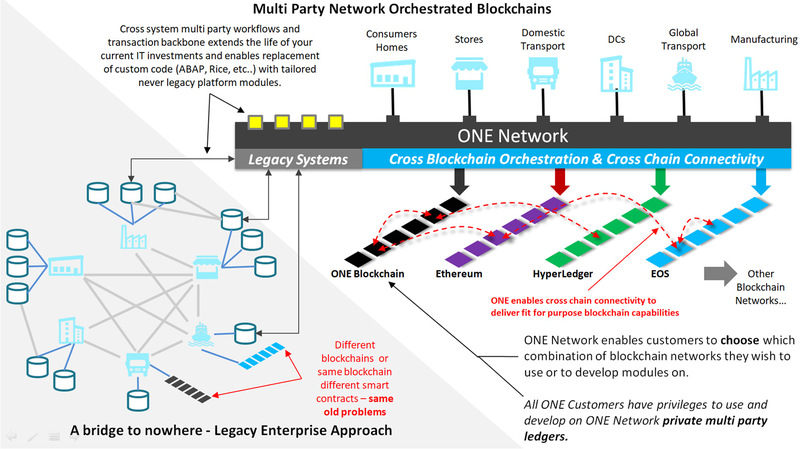 One Network has designed a multi party business network platform that operates across multiple Blockchain networks combining capabilities with battle hardened network aware autonomous AI agents, machine learning agents, and a modular adaptive development platform.